Project Watershed campaign calls on the arts community to help preserve the Courtenay River Estuary. What would you do if you couldn’t find the kind of tortillas you wanted in the grocery store—pure corn without additives or preservatives? you start making your own, and turn your kitchen experiments into a successful home-based family business making organic, hand-pressed tortillas. That’s just what Harvey and Jesus Miller did with daughter Lisa, son-in-law Jorge, and son Lin. And along the way, they found a market of health conscious consumers longing for an authentic taste of Mexico. “We’re not exactly a secret,” is the first thing Harvey Miller says about the two-year old company they named Abuelo’s, meaning Grandfather in Spanish. Instead, they’re a lot like the store-front location at the corner of Coleman and Bates Road—a truly pleasant surprise when you find them. “We came from Mexico, all of us, five years ago. I had retired there,” explains Harvey. However, two growing children meant Harvey and his wife Jesus needed to give serious thought to the kind of opportunities they wanted to provide to their kids. They were especially keen to have the children experience the Canadian school system. So, the decision was made to return to Vancouver Island, where had Harvey spent part of his childhood and had his first career as a mill owner. Once settled in the Valley, the family started looking for the kind of corn tortillas they were used to in Mexico. They couldn’t find them—at least not without preservatives and additives. So, they ended up buying the corn masa flour, building a traditional wooded tortilla press (think two eight inch square blocks of wood with a handle to squish a ball of dough) and making their own. This was actually a big deal. “Even in Mexico it’s rare to make your own tortillas,” says Lisa. “It’s like home-made bread.” Some people do it, but most people go to the tortilla-maker every morning to buy fresh made tortillas that they eat that day. The tortillas are made with fresh flour, and like all fresh food will spoil without refrigeration. None of this stopped Jesus from figuring it out all out. Pretty soon she was making tortillas all of the time, much to the delight of family and friends. Then fate took over. “The Road Runner Café became available,” says Harvey, adding that the family decided to purchase the business and make authentic Mexican food, along with traditional Canadian breakfast foods. At first, customers were a little uncertain about the Mexican fare, especially the tortilla dishes. This was not the Tex-Mex food most Canadians grew up on. There were certainly no hard-shelled tacos on the menu—that’s an American interpretation of Mexican food almost unheard of in Mexico. However, customers quickly came around. “People were wanting to take tortillas with them,” says Harvey. “It wasn’t long before people were coming in just to buy the tortillas. “Vancouver Island has so many people that have experience in Mexico, and one of the comments we started getting was, ‘These taste just like the ones we got in Mexico’,” he adds. With an apparently ready-made market available, the Millers did what any sensible business person would—they developed packaging with the help of ABC Printing and started selling pre-packaged tortillas out of the Café. Jesus took a picture of her father, a Mexican cattle rancher, wearing his cowboy hat and Photoshopped a chef’s hat onto his head and created a logo. The picture of Grandpa Gonzalo was also the inspiration for their company name Abuelo’s. “Bit by bit sales started to get brisk,” says Harvey. Edible Island started carrying their product for sale, increasing sales and demand. From a business perspective, this would be great. The problem was the family was basically running two businesses themselves. The Café was open from 7:00 am to 2:00 pm daily, and then they would spend the rest of the day, usually until 10:00 pm, making tortillas and doing kitchen prep for the restaurant. This went on for about two years, when one of the Café patrons expressed an interest in buying the business. “It was the perfect timing for us to focus on making tortillas,” says Harvey. That decision to focus on making tortillas necessitated some important decisions about just what kind of product Abuelo’s was going to be. The Millers had the option of going to a fully automated production facility, where all the tortillas would be made by machine. However, Jesus quickly decided that wouldn’t be good enough. A machine would require a dryer, stiffer dough than the hand-pressed recipe Jesus had developed in her own kitchen and served at the Café. To her, the taste and texture of the machine product was too different from what they had been making by hand. “My mother always refused to compromise the quality of our food,” says Lisa. “Everything was fresh.” In fact, Jesus held firm to the belief if she wouldn’t buy it herself, then she wouldn’t sell it to anyone else. “It wasn’t very long in the production that we said our tortillas are hand-pressed,” says Harvey. That means one of the family takes pre-weighed pieces of dough, puts them on the press between two layers of plastic, takes the handle and presses down to create a flat tortilla. The process is relatively simple, but takes some body weight behind the press to get the right thickness and a lot of dexterity to peel the uncooked tortilla off the plastic without tearing the delicate dough. They also made the product organic and certified gluten-free. Corn is, of course, gluten-free naturally. And a basic tortilla recipe is just flour and water. However, as anyone with food allergies knows, it’s not the product that might be the problem but cross-contamination. For anyone with Celiac’s disease, even gluten residue from a press used for both wheat flour and corn flour tortillas can trigger the gut’s immune system and cause severe pain. It was a common problem the Millers came across when running the Café, in addition to soy and dairy allergies. The product certainly speaks for itself, especially during in-store demonstrations and at the Comox Valley Farmers’ Market. During demonstrations, the Miller’s press fresh dough using the same tortilla press as in their production facility and then cook fresh tortillas on a griddle. The only difference between the demo product and the packaged product is how they’re cooked. The production facility uses a commercial grill, and the hand-pressed tortillas are placed on a conveyer belt to be cooked on one side and then the other. Either way, the end result is a soft, chewy tortilla good for anything from a traditional quesadilla to a peanut butter and banana sandwich wrap. However, they are educators, and Lisa loves nothing more than talking to clients about what’s in Abuelo tortillas, how they’re made, and what you can do with them. Take for example the fact that Abuelo’s tortillas can be bought made out of white or blue corn. For most locals used to seeing only yellow corn, the blue sometimes catches them by surprise. In Mexico there are far more varieties of corn available on the market, including a blue corn that can be ground into flour. The end product is full of natural antioxidants (like any other blue or purple fruit or vegetable), has more protein, less starch and is good for diabetics. Then there’s the calcium hydroxide included in the ingredients on their packaging. Doesn’t exactly sound natural, does it? Well, corn flour is made from maize (or corn) cooked in water that includes ash or lime. The process is called nixtamalization and it goes back thousands of years. Somehow, somebody figured out that when you added ash to the cooking water you made the corn more nutritious, and helped prevent diseases like pellagra (a vitamin deficiency) and kwashiorkor (a protein deficiency). All the ash—today calcium hydroxide—is washed off after cooking and before grinding. However, it has to be included on the label because it’s part of making the corn flour. Abuelo’s Tortillas are available locally at Edible Island, Seeds Natural Market, the Purple Onion Delicatessen and the Comox VAlley Farmers’ Market. For info visit www.abueloscorntortillas.com. Nancy Morrison works on her stained glass piece for the art auction in her Tin Town studio. 000 birds. It is also home to 218 plant species, 29 fish species—including all five species of pacific salmon—and innumerable species of intertidal creatures. Beginning with the inspiration of a single water droplet, the effort to raise awareness for the protection of this important estuary has spread to encompass the whole watershed, from mountains to ocean. The Keeping it Living estuary awareness campaign coordinated by Project Watershed Society is now in its third year, and has grown to involve artists, scientists, environmental groups and the outdoor recreational community. Stained glass artist Nancy Morrison was one of the early visionaries of the campaign. In her Tin Town studio, surrounded by color and light, Morrison recalls the ideas that led to the development of the campaign, following Project Watershed’s Heart of the Watershed estuary symposium several years ago. “I had been thinking about art and the estuary for a few years, and heard about the symposium coordinated by Project Watershed in 2008. When I read the Keeping it Living statement that came out of the symposium, I was quite surprised that it was so similar to what I had been thinking about,” she says. “Project Watershed was at Earth Day, with a big 3D map of the whole watershed, and I thought ‘Oh wow’!” she recalls. “It was such an incredible image, really bringing across that the watershed involves the whole of Baynes Sound, and the whole mountain range—the estuary is such a good focal point including the whole water system. It is easy to see how Holbrook’s energy and enthusiasm contributed to the campaign. Even now, with a young baby and on leave from Project Watershed, she projects the same spirit that carried the campaign forward. “Under the direction of Don Castleden, Project Watershed chair at that time, we formed the Estuary Working Group after the estuary symposium,” Holbrook says. Project Watershed has been promoting community stewardship of Comox Valley watersheds through information, education and action since 1993. Their mission is recognized locally and internationally for the ability to provide technical expertise in the area of watershed inventory and mapping, and for the ability to involve volunteers in diverse stewardship programs. Project Watershed chair Paul Horgen and Kona. The core fundraising concept was to invite artists to submit pieces for a silent auction, with 50 per cent of the proceeds to the artist and 50 per cent to the awareness campaign. The art entries are also awarded several prizes, including the purchase one of the art pieces to feature in the next year’s campaign. The Keeping it Living campaign this year culminates with a special event on July 28—Experience the Estuary. This event involves the “Art for the Estuary” silent auction, an afternoon flotilla, a slough walk with Wayne White, and an early evening performance by the Kumugwe dancers at the K’omoks Band Hall and Big House. Different launch sites for the flotilla will take the speed of different craft into consideration. “Dragon boats will go quickly, kayaks as well, canoes more slowly—there could be group leaders to set the pace and keep people together,” says LaBossiere, noting that Comox Valley Kayaks has more than 50 kayaks and several canoes available to rent for the flotilla on July 28. Paul Horgen, current chair of Project Watershed, and director Betty Donaldson joined the Project Watershed board after the first event. Donaldson, a retired professor of education, once served as president of the Canadian Recreational Canoeing Association. She spearheaded a survey of estuary residents last fall, revealing a growing awareness about the estuary. 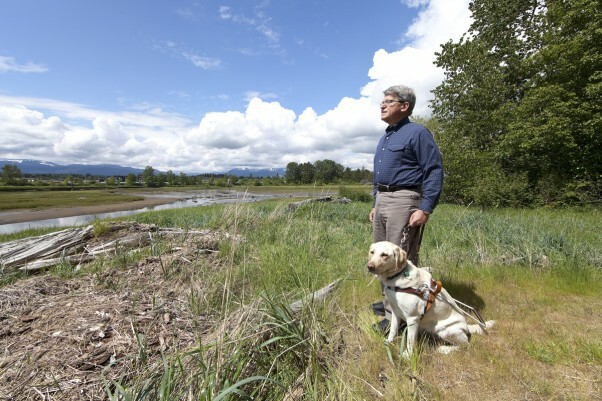 Horgen, a retired biology professor, attended the Estuary Working Group meetings, joined the board and contributed immediately to the campaign. “At the time the awareness campaign was starting, I decided a way to launch it was to purchase a painting by Bev Byerley,” Horgen recalls. The Comox Valley artist—who has entered an art submission every year—is noted for her striking paintings of the estuary. Horgen gathered a group of Project Watershed expertise to put together a background proposal. In October, he made a presentation to local politicians, presenting an overview of Climate Change, carbon sequestration, and carbon offsets. He described how estuarine plant communities could remove CO2 from the atmosphere much more efficiently than land plants, and permanently. The ‘Blue Carbon-Blue Forest Pilot Project’ could restore habitat lost during the last 75 years, which would help bring our estuary back toward its historical level of abundance, and contribute toward mitigating climate change. A resolution was pass unanimously to request that the Province of BC support this initiative through its Climate Action Charter. The scientific concept of Blue Carbon led to the artistic theme of the ‘Blue Forest’ as the inspiration for artwork for the 2012 Keeping it Living Campaign. 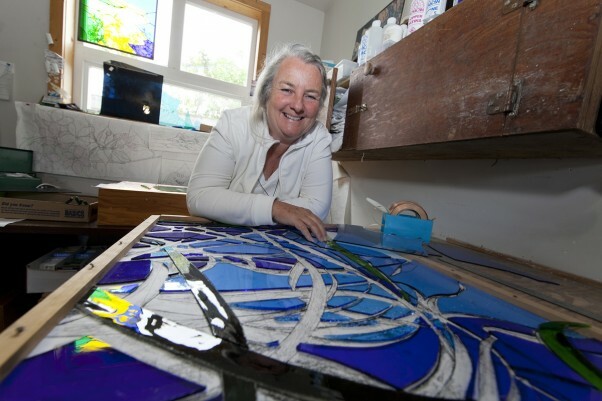 The stained-glass work that Morrison is entering for the 2012 art auction and competition is spread in curved pieces on her work table. The fluid shapes reflect the ‘Blue Forest’ of eelgrass that lies under the water of the estuary. Other artists she has approached are similarly inspired, and local venues are receptive to displaying the artwork. Artwork will be on display throughout July at the Gatehouse and Wandering Moose Café, Carderos, Mudsharks, Zocalo and Atlas cafés and Avenue Restaurant. “There’s a flow to the whole campaign—the synchronicity continues,” says Morrison. “I’m really inspired by David Bohm, the physicist. He talks about dialogue, that we all have a say—that’s also the First Nations way, where everyone has their own perspective and listens to each other. Then from the whole group a solution arises. “This is what a community can do, we can inspire the rest of the communities. If we focused on taking care of the water, we would by association take care of humanity and the planet and the economy would function properly. If we take care of the heart of our community we would create the return of abundance. We have such a beautiful place here, and this is the incredible artwork we are producing that could attract attention. For more information visit www.keepingitliving.ca. An excellent article by Krista Kaptein, managing to capture the short, yet colourful, history of the Keeping It Living campaign and giving some much-deserved kudos to those that have been passionately working at the Return of Abundance.